Despite being on the ‘right’, I’ve long been a critic of the fashionable and perennial assertion that America is ‘dumbing-down’ or in a state of intellectual decline. Purported dumbing-down is refuted by counter evidence. There are 7 billion people alive. Assuming IQ does not fall much, that means there is 2x as much brainpower as when the population was only 3.5 billion, and technology and other advances helps further boost cognitive potential. 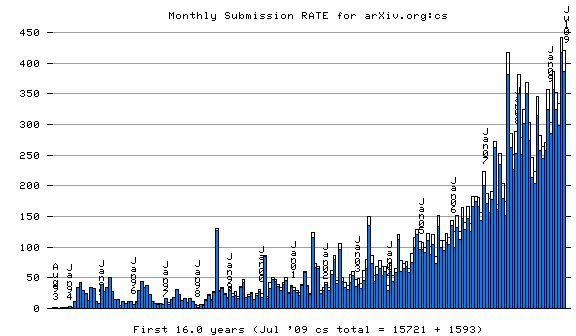 On sites such as Arxiv, thousand of technical papers published each year, and the rate of submissions keeps growing. 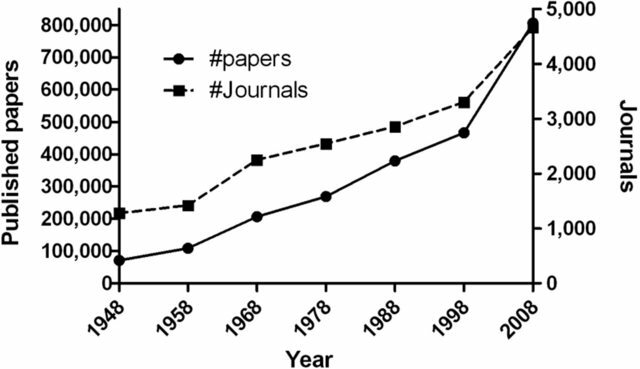 Such growth is observed for almost all prestigious journals in economics and physics. There are new discoveries being made every year in fields as diverse as AI, economics, math, physics, computing, programming, biology, etc. Online, as evidenced by the massive traffic stats of websites and blogs such as Stack Overflow, Scott Aaronson’s blog Shtetl Optimized, Terrance Tao’s blog, Math Exchange, and Wait But Why, there is enormous interest in even the most complicated and esoteric subjects. 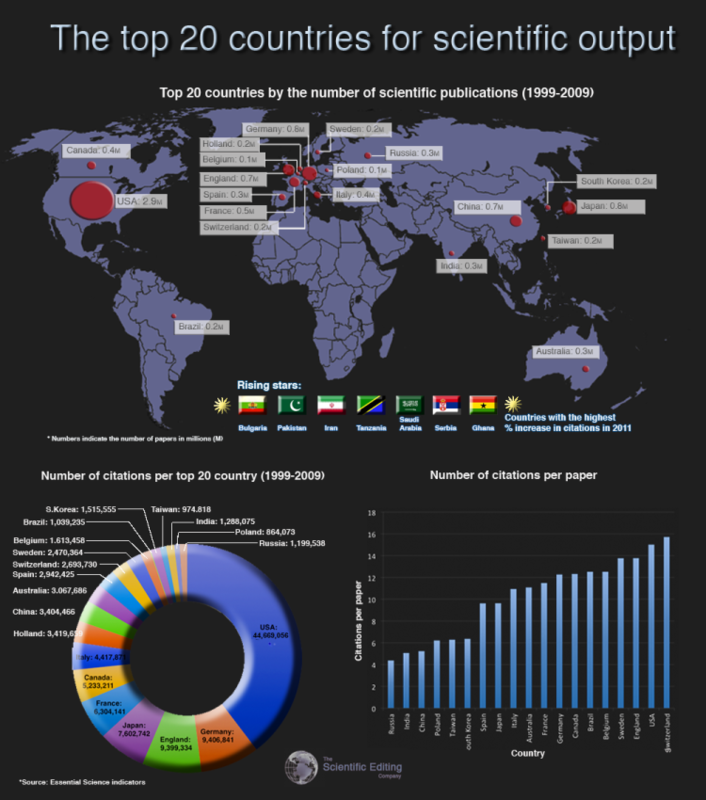 The number of papers published has exceeded population growth. In 1968, the global population was 3.5 billion people and 200,000 papers had been published. 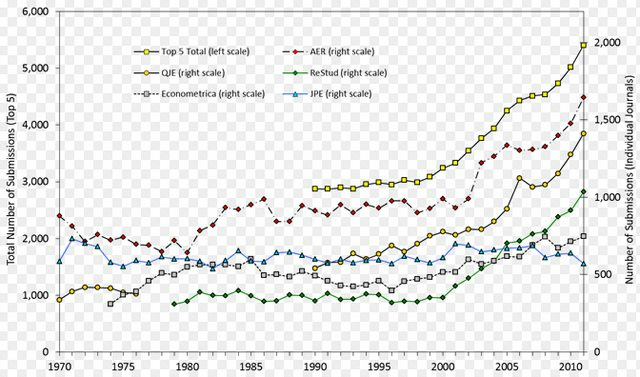 By 2008, the population was 6.7 billion, a gain of about 90%, but the number of papers published had risen 150%. Why do so many high-IQ foreigners want to come here? Because America, through its generous STEM grants & loans, institutions, as well as free market, rewards intellect more so than any other country. If you’re a promising physicist, mathematician or computer scientist, going to America offers the best shot at recognition and riches. Yeah, there is a lot of useless leftist propaganda taught at universities, but there is also a lot of good theoretical and applied research in the sciences, many of which will have practical commercial applications in the future. Some people say you can learn everything online, and maybe this is true for certain STEM fields like pure math, but some fields like physics, engineering, and computer science require labs and other capital-inventive equipment that necessitates a research facility. Often the Kurt Vonnegut short story Harrison Bergeron is retold as a sort of prophetic allegory for such dumbing-down. Over the past few years, I’ve heard it recited many times, most recently on a September 2017 Jordan Peterson podcast. This is self-refuting for two reasons: Harrison Bergeron was published in 1961, which may come as a surprise to many, and shows how such sentiment of perceived dumbing-down long predates the modern era. Probably every generation feels that their generation is dumbing-down. Second, if it was intended to be prophetic, the timing (so far) is off. Since the story was published, there has been a proliferation of technological progress: the internet, personal computers, manned spaceflight, etc; however, the story is set in 2081, so it’s not inconceivable that in the next 60 years society could crumble into an egalitarian dystopia, but the evidence at the moment augers against that. Trends such as widening wealth inequality and the increased importance of IQ shows that America is becoming more individualistic and more unequal. Up until very recently–the early 2000′s or so–the universities were an appendage of American society, not the body itself. When people complain America is dumbing-down or that Americans are dumb and ignorant, this is one of those instances, to borrow some cliched phrases, I say you need to ‘broaden your horizons’ and ‘get out more’. As dumb as America may seem, as I showed a few days ago regarding the IQ vs. corruption map, the rest of the world (save for a handful of Nordic countries) is worse. Australia is a giant welfare state funded by its natural resources. South America and Southern Europe have low national IQs and are overflowing with corruption, incompetence, and liberalism. Social justice and fat acceptance is a bigger deal in Brazil, Canada (Jordan Peterson and the Canadian Human Rights Act), and Spain than in America. During the 17-19th centuries, Britain, Germany, Spain, Italy, and France used to be bastions intellectualism, producing volumes of art, philosophy, mathematics, and literature, but by the end of WW2 had lost their empires and intellectual dominance. Now, France’s greatest intellectual export is postmodernism; for Germany and Italy, it’s overpriced unreliable cars (instead of cutting-edge rocket technology and philosophy such as Nietzsche). The Manhattan Project, the Jewish exodus out of Germany (and also other parts of Europe), and the Cold War contributed greatly to America’s intellectual dominance, especially in the sciences. With the exceptions of Penrose, Dawkins, and Hawking, Britain just doesn’t have many great scientists; they either move to America or were born in America. Same for Germany. Of course, this doesn’t prove that such dumbing-down cannot occur in America over the next 20-50 years.